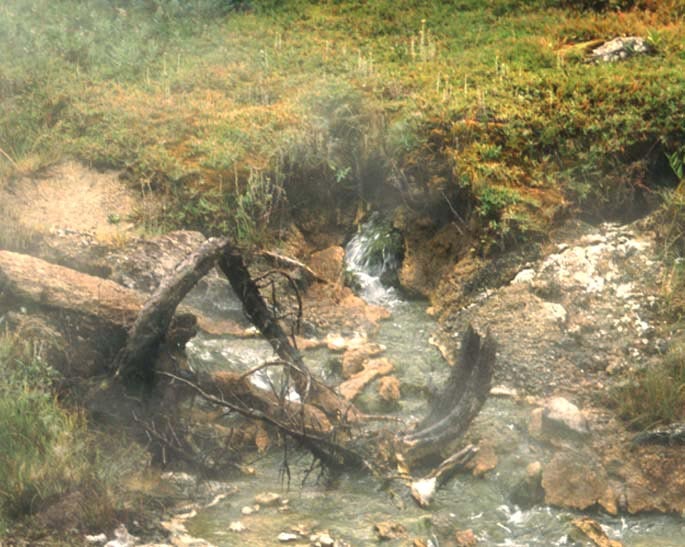 This title combines two official grant titles this project has encompassed: 2000-2002 "Undergraduate Research in the Molecular Diversity of Hot Spring Bacteria"; and 2003-7 "A Longitudinal Molecular Diversity and Chemical Survey of Red Layer Microbial Communities in Yellowstone." 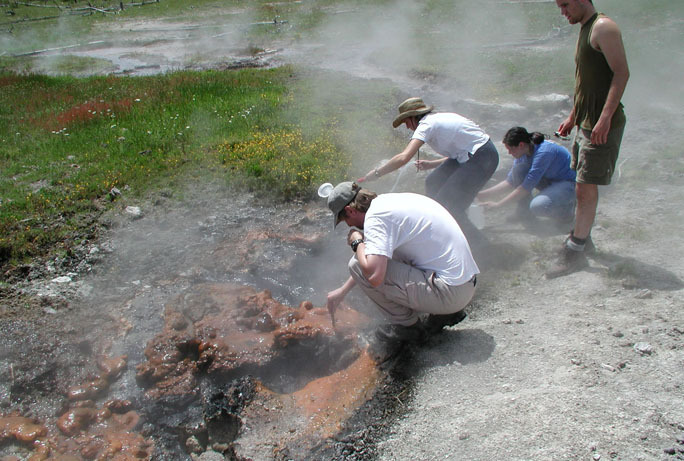 Extreme temperature [45-60°C] microbial communities such as those thriving in hot springs in Yellowstone National Park are hypothesized to be modern analogues to the most ancient forms of life on earth. Evidence of stromatolites resembling modern mats exists from at least 3.6 billion years ago [Schopf and Packer, 1987]. Petrographic thin sections from stromatolites reveal filamentous bacteria resembling extant phototrophic species such as cyanobacteria and Chloroflexus [Walter, 1983]. Micropaleontologists consequently hypothesize that ancient bacteria were also phototrophic [Walter, 1983]. 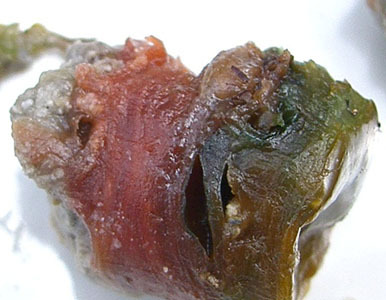 Current research of thermal mat systems, therefore, inquires to discover and identify new filamentous mat-forming bacteria that may be relatives of the most ancient forms of life on earth. 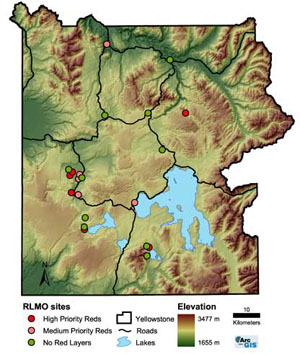 Map of Yellowstone with RLMO sites. This remote thermal basin, one of the southernmost along the Yellowstone caldera, requires 2-3 days of backpacking to access. This impressive mat was one of many similar features up the Ferris Fork drainage, accessed from Three Forks. Fairy Geyser has been a consistently active spouter that supports an extensive mat with a variable red layer community. Fairy springs are significantly off-trail. Modern mat communities are often composed of two types of organisms that form distinct laminations. The top layer of these mat systems is generally composed of oxygenic, photoautotrophic cyanobacteria. Beneath this lies a layer of anoxygenic, photoheterotrophic Chloroflexus [Castenholz, 1984]. Incident light striking the mat surface is filtered through the mat such that the quality of light penetrating each layer of the mat differs. At each layer, the phototrophic organisms consume those wavelengths absorbed by their pigment-protein complexes. In this way, the light-absorbing properties of the bacteria within the layers of the mat are believed to correlate with their positions in the mat [Castenholz, 1984]. Copyright on all images and material by Sarah Boomer 1998-2005.